What a feeling to hear one of your creations being declared “the knife of the year” at the Blade Show in Atlanta. It is our sixth prize since 2012. It is quite something, to have started off in the little Italian town of Maniago, an unforgiving land at the foot of the mountains, and to be here now, a winner, at the biggest knife trade show in the world, in the city home to Coca Cola and the world’s busiest airport. Little David from Friuli continues to take on the Goliaths of American business. This is our third “Overall Knife of the Year” award, after the one in 2014 for TiDust and in 2015 for T.R.E. Titanio. A hat trick, topped off by an even more prestigious achievement: the “Manufacturing Quality Award”, which crowned LionSteel as the best company in 2014, knocking the Yankees off the top spot, which they had held since time immemorial. To continue the football metaphor, it is like winning a World Cup final in Rio de Janeiro against the home side with team of amateurs. 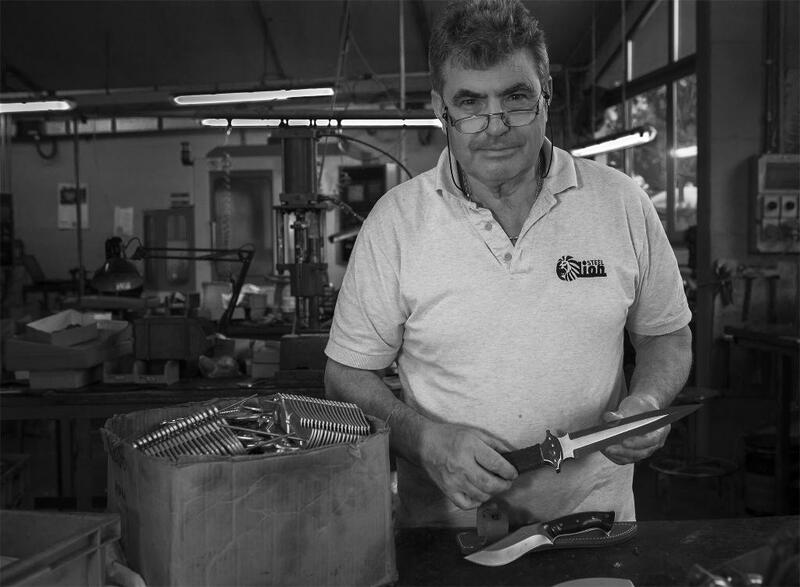 Except that there is almost nothing amateurish about the industrial performance of LionSteel; just one element has remained the same over its almost sixty-year history, since Gino Pauletta started his existential relationship with knives. It is an increasingly rare and valuable specimen: passion. Today, it is his son, Gianni, picking up the award in Atlanta. That’s right, because Gino is one of those stubborn craftsmen that will not leave the workshop, but will happily hand over the reins. He knows that the same burning desires and dreams can take on the form of new technologies and new materials, go down different and unexpected paths – and it must be the younger generations, less intoxicated by feelings of nostalgia and with more energy to give, that take on the challenge. That is why, at the turn of the century, or rather the new millennium, Gino passed the baton to his sons: Daniele, Gianni and Massimo. But he has never left the factory, of course not. He is still there, working his magic, wanting to make toys that often turn into gold and, sometimes, inspire new products. Gino is the wizard that thinks with his hands and, when he thinks, his bright eyes smile from corner to corner, and it is almost as though the object is reflected in the glint of his eye a few moments before it comes to life. Everything he does is well thought out and shows determined direction. He started out as a young boy, on 1 January 1957, at FARM, Fabbrica Articoli Reclame Maniago. To guarantee himself some economic freedom, and satisfy his insatiable passion, he did not think twice about clocking up extra hours in the evening and on Saturdays and Sundays, working on behalf of third parties. That was how it was back then, even working 15-hour days because a workman’s pay was not enough, especially if you wanted to start a family. Then, in 1969, the time came to break away, just like the LEM did from the Apollo 11 in that very same year, aiming for the moon. Gino was not to know precisely where his “moon” was at the time, but nonetheless he wanted to become an entrepreneur, a craftsman, and follow his own, solitary path, with the enthusiasm of someone who knows they have got a bit of America already in them. 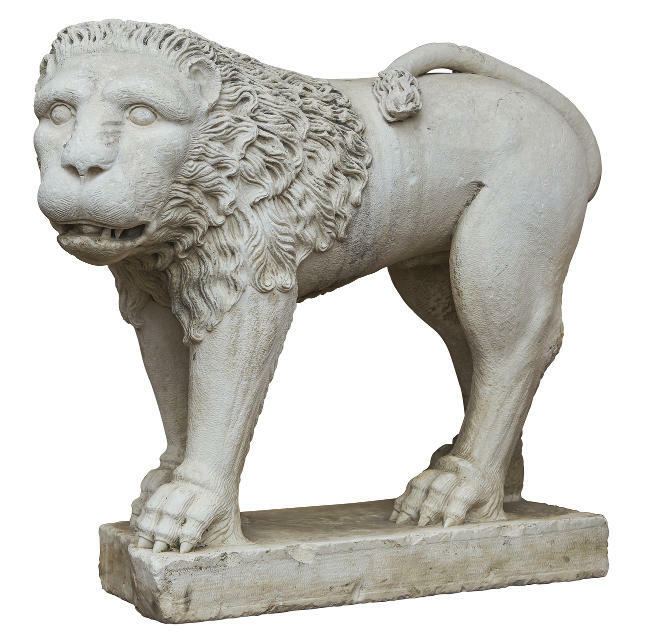 A lion roared inside him, the same lion that his masonry ancestors had carved with the stone of Mount Jôuf and, in the courtyard of his home, watched over the children with an evil twinkle in its eye that sent shivers down the spine. That wild beast remained fixed in his mind, and it later became his trademark, for its primeval power and, better still, for what it represented: its being, an envisaged form, carved into a raw material. That form is what Gino alone sees in a piece of raw metal, a knife edge he traces with his gaze, that imperceptible curve that only to him looks like valleys and mountains, then the filing, over and over again to achieve the perfect gradient, so that all the blades of that multi-purpose knife fold away side by side, precision down to tenths of a millimetre, without touching, slotting into place with a “click” that brings joy to the most attuned ears.Music to the ears, indeed! And so what if it is not always knives. What matters is taming the beast, shaping the metal. In 1969, an order for a hundred or so tin openers for Farfalli came to christen the new company, and that soon turned into 3,000, then 3,500, and so on. Then came the pen knives for Coricama, which made their way to Milan, Rome and Germany. It wasn’t time for America yet, but, at that point, Italy and Europe were enough. So, here’s the story. It was a warmish day in winter 1978. In Friuli, the earthquake had left a lot of open wounds, but we were not to complain: the economy had picked up, full steam ahead, the orders were coming in and taking a few days off was not out of the question. Gino, with his wife Cesarina, was visiting relatives in Milan. They took a stroll through the famous gallery, under that vaulted glass roof supported by metalwork. Just beautiful. Gino, especially, was really able to appreciate it. Then a gift shop window caught his eye, who knows why, and everything else around him vanished into nothingness. Like a mirage in the desert, that pocketknife, made in the USA, was the only thing he saw. It was a delight like nothing he had ever witnessed before; he had to go in and buy it, no matter the price tag. Sixty thousand Italian lire [ed. about 30 euros]. Quite a sum. Quite an investment. The beauty, this time, was all in the handle, made using two materials combined together with inlays. There was no time to lose. He had to replicate that masterpiece, with a special touch of made in Maniago innovation, of course. It was time Japan met Italy. Gino was able identify the perfect two materials for the job: brass and olive wood. He was the first to come up with this elegant combination, even just the olive wood alone would have been a major innovation. The time had come to industrialise the idea and put together the members of the consortium to do it. For the most important production works, he found the right person for the job in the town of Malnisio, and work could finally begin on the first prototypes and then the start of production. That is what you call a businessman. Someone who knows how to imagine the value of an object that does not exist, of a product in the making, and then gets on with making it, bringing it to life with his own hands. That is what Gino was like, and had been since he was a young boy working at FARM, since the day he found a nugget in Colvera creek, the torrent waters which had powered the mills of Maniago for more than a thousand years, that living water that transformed metal. The nugget was a scrap from a knife maker’s. In that rough gem, that piece of waste from our industrial civilization, Gino saw his first pocketknife; he held it close him, to make sure it did not get away, and, with not very much but a good dose of willpower, he liberated it from its half-formed destiny. When he thinks back to that first endeavour as a young man, he feels even closer to his own sons, to each of whom he has passed on a part of his passion. Gianni travels the world seeking out (and delivering) innovation, and today he is the one in Atlanta. Daniele and Massimo work by his side in the workshop and continue to listen to his advice (but thankfully they do not always agree with him!). What matters, nonetheless, is that his passion has been contagious and now flows in their veins, in their lives, making them surprise him every day with new creations, which he would never even have been able to imagine. So many materials. Such different processes. The speed of blade production with 3D design, water jet cutting and laser cutting. And yet, if we look at the real essence behind it all, not much has changed between then and now. The real furnace burns away inside of us, the bellows are the sound of our heartbeat. High technology, the one that Gino knew and the one his sons know today, is, above all, powerful imagination, a journey of the mind inside a form, anticipating the difficulties and the resistance of the materials that you have to get to know and to love, to fight them fairly. To defeat the lion. When Gino looks at the products from the last decade, it seems impossible that his boys were able to make a titanium monolithic handle, milled from a single unit. Or the ultra-light TiDust model with openwork, made by selective melting titanium powder: the first knife in the world made using aerospace technology! The LEM that broke away from Apollo 11, when he opened his workshop, is still en route. It is heading beyond the moon and Jupiter too, towards infinity, with his sons as the crew. And it will go on travelling as long as there is a desire to explore. Even though, as a man true to his origins in Maniago, he struggles to admit it, Gino is proud of his sons. He is proud that Gianni is there, in America, right now, receiving his first prize. Gino has never been to America. America found him, that day in Milan.